In the previous article, we’ve discovered an overview of the Silverlight application built to edit levels for the XNA game. Let’s now analyze how I’ve built it and which are the interesting Silverlight features inside it. Note : you’ll find the complete final source code of the Silverlight application demonstrated in the previous article to download at the end of this blog post. I’ve tried to add as much documentation as possible. Comments in the code and this article should then be fairly complementary. 1 – How will I build the level design surface? From an existing control? Building my own control? 2 – How will I generate the thumbnails of the levels loaded and displayed in the ListBox on the right? To build this version, I just had to modify with Expression Blend the style of the DataGrid to change the way it was displaying the current line selected and the current cell selected. Moreover, I was hard-coding the number of rows and columns to format the DataGrid control for the structure of the XNA game level. 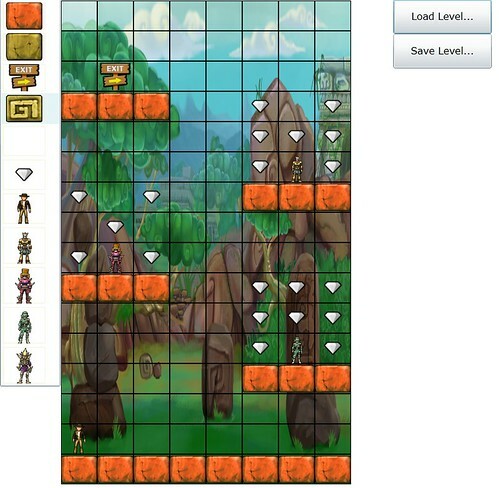 8 columns and 16 rows are needed for instance for the Windows Phone 7 version. – How dynamically change this approach to load other type of platform levels like those from the Xbox 360/PC that need a different number of rows/columns? – The “line by line” logic of the DataGrid control wasn’t really designed for my needs with the level editor. Moreover, this control embeds a lot of useless logic for my level editor. Ok, let’s then try to think for a couple of seconds and use a better approach. What do we need on a functional point of view? An in-memory collection of elements (for my blocks/cells), a selectable element to be able to change it by other one during the design process and finally an event that will inform us that an element has changed. Well, there is already a control providing this logic: it’s named the ListBox control. Ok good, why not. But… this control doesn’t display the elements in the form of a grid, does it? No, that’s true but this is not a problem. We’re going to ask it to change his behavior. For that, we’re going to use the magic of the Sivlerlight templating engine. I’ve then used a ListBox control where I’ve changed its ItemsPanelTemplate to be able to finally draw the elements in another way: through a Grid control. We’re indicating here that each element of the ListBox will now be a BlockCell UserControl (thanks to the redefinition of the ItemTemplate). Then, we’re also indicating that the elements won’t be displayed anymore vertically like a basic ListBox but through a Grid control. In a general manner, this is how we should think when we’re developing using WPF or Silverlight: what are my functional needs and is there an existing control from the framework/toolkit matching these needs. After that, the visual aspect can be easily modified through the XAML with Blend for instance. My BlockCell control is simply a UserControl containing an Image control that will display the corresponding level block. We’re now missing one final step to make this works: distributing all the cells of my ListBox collection in the different cells of my Grid control. Thanks to the GetVisualParent<T>() method, we get a pointer to the instance of the ListBoxItem element containing our BlockCell element and we’re setting on it via binding the desired position in the columns and rows of the grid. Note : I’m getting registered to the Loaded event of the Grid control used inside the ItemsPanelTemplate in order to be able to get its instance. Once the instance get, I’m formatting the grid control dynamically by code to set the proper columns & rows definitions. I’m then more flexible to changes if I need to edit levels from another platform (as the Xbox 360 or PC). My first idea was to use a new feature that shipped with Silverlight 3: the WriteableBitmap. We can indeed generate some kind of screenshots inside a Bitmap image of a specific control or specific part of the Visual Tree of Silverlight. I then simply thought that I will generate some screenshots of my levels once loaded and display the output image in the ListBox displaying all the level loaded. Furthermore, when the user will click on the level editor control to modify a cell, I will generate again a new screenshot to modify the thumbnails used in the ListBox. 2 – When you’re drag’n’dropping several files, my code ends up into a pseudo-multithreaded context that completely breaks my weak logic code that checks the number of passes in the LayoutUpdated event. A solution could be to prevent loading several files during the drag’n’drop operation and only load the first one for instance. But this would have been a pitful solution. The final solution to resolve all my needs/problems I’m sharing with you since the beginning of this article will then be to build a “real” control that will be used also in the ListBox displaying the levels with their thumbnails. Then, thanks to the bidirectional binding, the update of the main level editor control will automatically update the thumbnail version in the ListBox without having to use the WriteableBitmap approach. This one is simply bound to the current selected element of the ListBox as you can see with the line in bold. 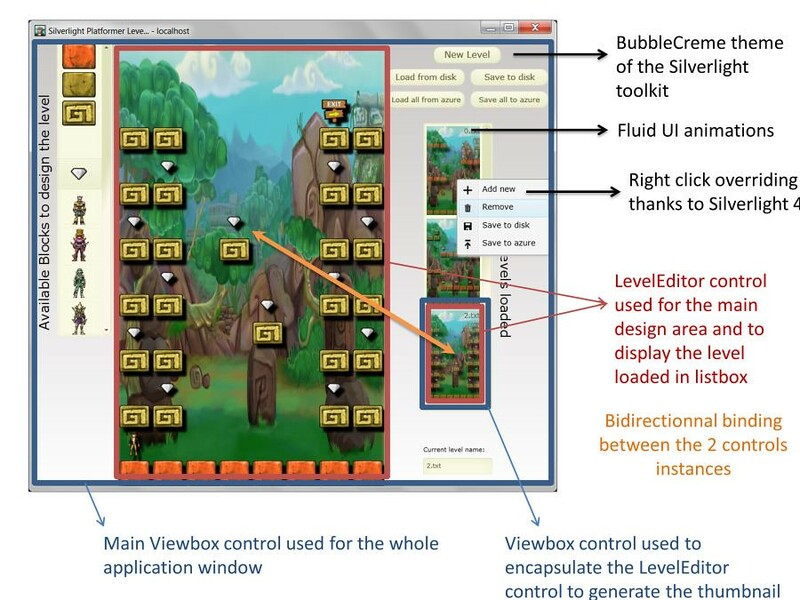 As you’ve seen in the overview video available in the previous article, the Silverlight application supports drag’n’drop operation of *.txt files containing the levels, right clicking on the ListBox elements displaying a contextual menu on the loaded levels and the new Fluid UI animations very easy to implement with Expression Blend 4 for instance. I’ve also used a Viewbox control to embed the complete window of my application to support dynamic resizing with no effort! As you can already find a lot of resources on the web on these topics, I won’t go deeper in the implementation details of these features in this application. // Equivalent of a double for loop thanks to LINQ! The LINQ request is building an expression tree that will be stored in the qGeneratedCells. As the ObservableCollection constructor accepts IEnumerable, we then pass the LINQ expression tree to the constructor as a parameter. This will then finally build our collection of empty cells for our level. The LINQ request is then executed only during the new operation on the ObservableCollection type. We’ll now see in the next article the details part on the way I’ve handled the Azure Blob Storage. Freaking AWSOME man! Going to try and port this to WPF somehow. Thanks for all the pictures too. It makes it easier to follow. Excellent article David. Keep it up.